Are we Allow to fish at Marina Pier ??? You can't fish on the pier itself but you can fish along the breakwater beside it. The right side(facing the sea) of the pier is a good fishing spot but I believe it is currently fenced up for some construction works. Peace wrote: You can't fish on the pier itself but you can fish along the breakwater beside it. The right side(facing the sea) of the pier is a good fishing spot but I believe it is currently fenced up for some construction works. This means that i can't fish there at the moment ?? Only one side is under construction, you can still fish on the other side. Unfortunately, it's the good side that is being fenced up for construction. Pics of the left side, you can fish where the fence ends. You should know that there are boats going in and out of that area during the day so you must be careful of where you cast your line. Good luck on your trip! think this spot not as good cos of the islandcruise ship going in and out..
marina pier have stingray ? The place certainly does have stingrays, I've personally witness a big stingray jumped out of the water beside the pier. But that side of the pier has now been blocked off. Was fishing there with my buddy and saw a barramundi near 1 meter long swimming near the rocks. Maybe dying not taking our bait. Anyway, its nice to fish there especially at night, cooling and free parking after 930pm. Saw people with catches like chermin and wolf-herring. alot groupers too, but beware of snags. Lost around 5-6 weights there. 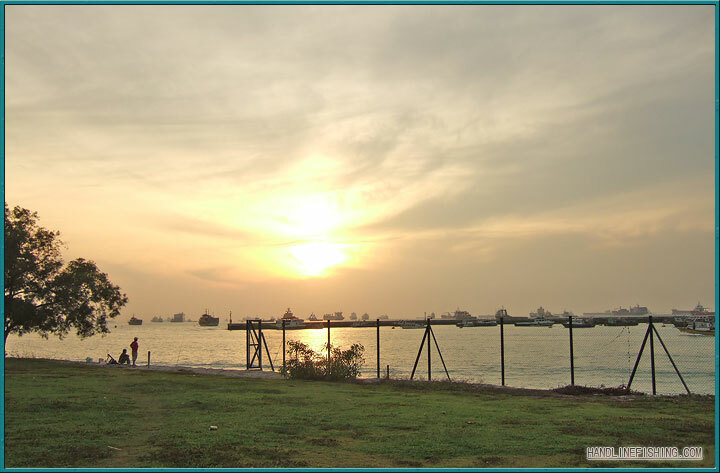 This marina pier is it the one near marina barrage pr the near the marina pier itself.. I'm not too which stretch of shore along Marina South that can be fished anymore since the heavy construction works have started there. I wouldn't fish too close to the barrage and the Pier though. They're also building another Pier next to the current Marina South Pier, that used to be a very good spot.